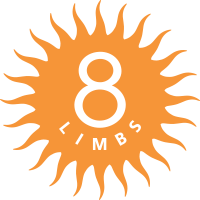 As an ambitious 26-year-old, I named 8 Limbs after the eight aspects, or limbs – anga in Sanskrit – of yoga. I did what some of us do when we find something we love, and want to share it with others, urgently, I bypassed the deep learning that is required to truly understand this eightfold practice. And by doing that I missed out on some key teachings, and engaged in what I now know as appropriation. I never even questioned if naming my new business after a yogic term was honoring of this practice and its origins in South Asia and North Africa. It took me 21 years of owning 8 Limbs to get back to the limb I skipped, the very first one, the yama-s – restraints: ahimsa (non-harming), satya (truthfulness), asteya (non-stealing), brahmacharya (moderation), and aparigraha (non-grasping). The yama-sare the ways of treating others that one engages in so that the yoga does not have harmful effects, and so that we reduce our harmful effects on others. I feel a full-body cringe when I really stop now and consider it. The irony! Back then, when I read through the yama-s, I just didn’t think they were all that important to spend time on – they were so obviously important tenets. But the real truth is that I didn’t want to look in the mirror and be fully and deeply responsible to them. I don’t think I was able to, at the time. I was too invested in setting myself up as a “good” and successful person and protecting myself – from the deep scrutiny that these precepts require and from acknowledging that I’d harmed, been untruthful, stolen, been excessive, and was very, very grasping. Eep! But things change, and yoga works, even if we try to skip a step. I am waking up bit-by-bit to the harm that can occur even with the best of intentions. I am finally studying the first limb of yoga, learning the ways I can avoid doing harm as a yoga practitioner and a human being. And 8 Limbs as an organization has become more committed to this awareness as well. It was pointed out to me recently, in a discussion in our Social Justice Team, that while yoga is not a social justice movement, when we live by yogic precepts like the yamas,we become intolerant of injustice. May we all become more and more intolerant of injustice. Let me know what you think about this at annephyfe@8limbsyoga.com.